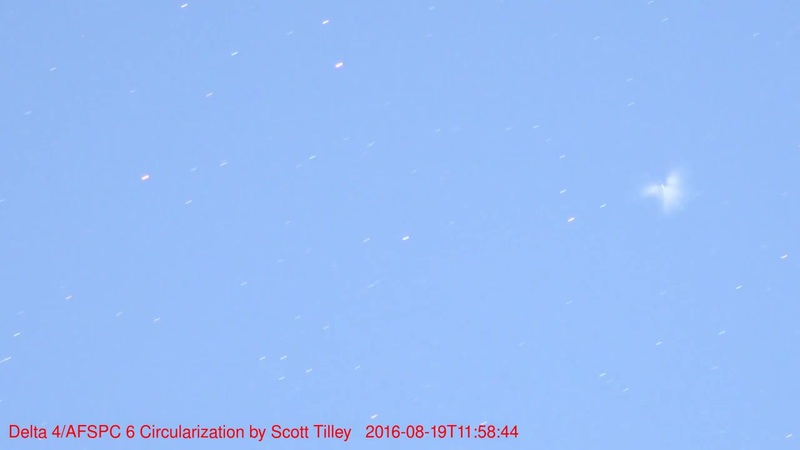 Video captured by Scott Tilley shows the arrival of the Delta Cryogenic Second Stage in its target orbit after a six-hour climb from its on-time liftoff from Florida early Friday. 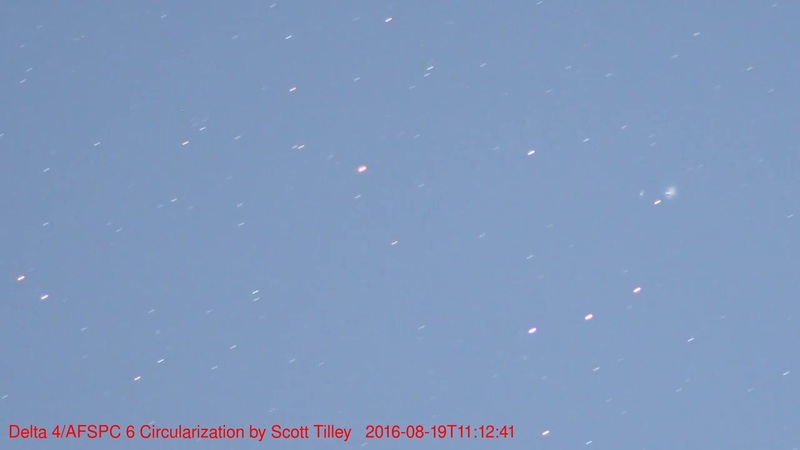 The exhaust/propellant clouds are visible in the right half of the frame. 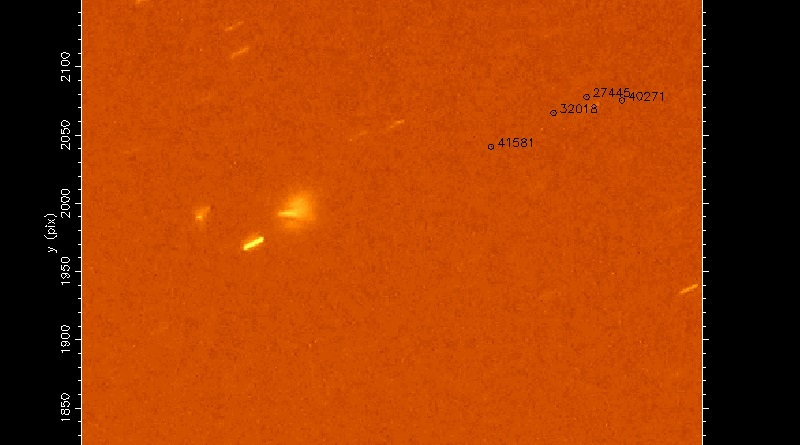 The classified delivery of a pair of orbital informant satellites on Friday by a ULA Delta IV rocket was documented on video by satellite observers on the ground, collecting fascinating imagery of the satellite separation sequence unfolding 36,000 Kilometers overhead. The Delta IV M+(4,2) rocket carrying the GSSAP-3 & 4 satellites lit up the night skies over Cape Canaveral at 0:52 local time, 4:52 UTC, lifting off after a clean countdown to embark on a semi-classified delivery for the U.S. Air Force. While the GSSAP program and its purpose is public knowledge after the project was declassified in 2014, the orbital activities of the program’s satellites are kept secret. To this end, Friday’s launch broadcast was ended just four and a half minutes into Delta’s mission to allow the satellite pair to climb to its secret operating orbit out of public sight. 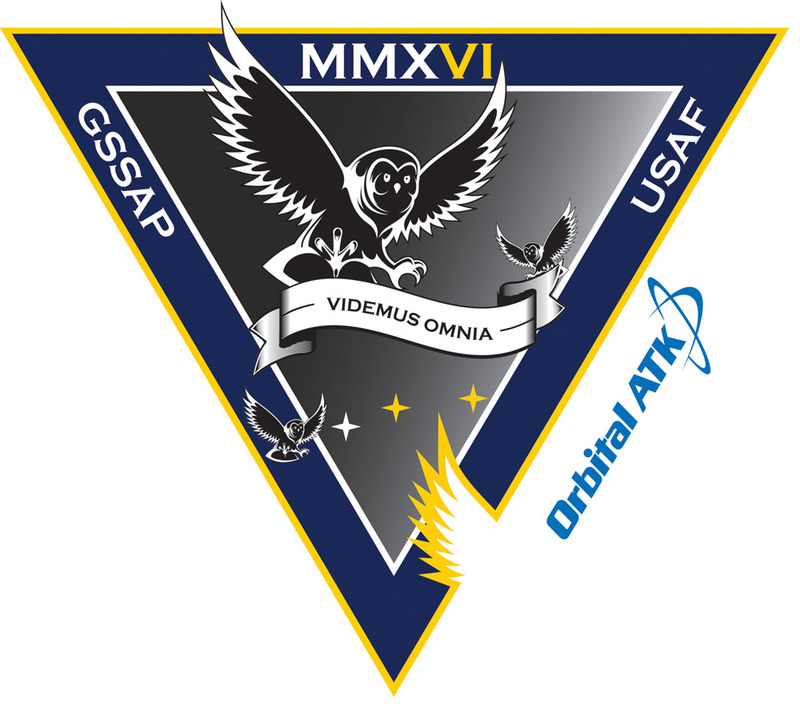 However, the amateur satellite tracking community made use of available information and the first GSSAP launch in 2014 to develop a road map for the AFSPC-6 mission with search elements issued on the SeeSat-L mailing list prior to liftoff. 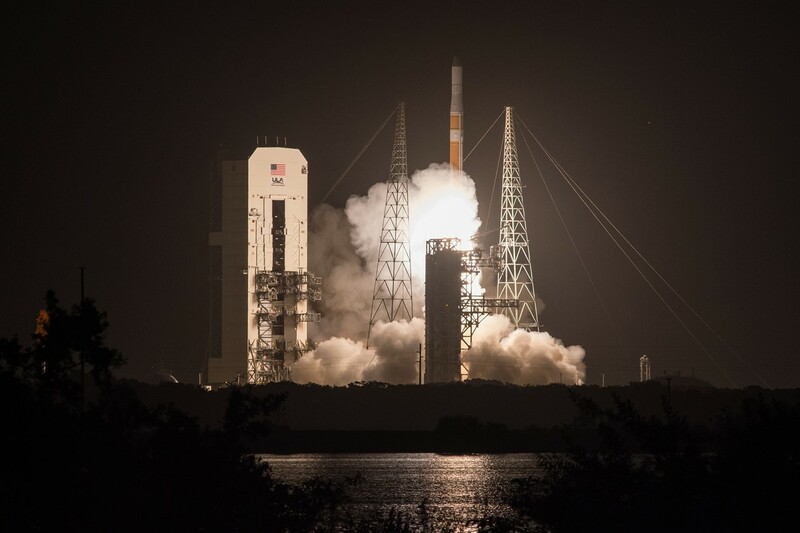 Departing Cape Canaveral to the south east, Delta IV soared into the night skies with a thrust of 565 metric ton force, delivered by a pair of Solid Rocket Boosters and the powerful RS-68A cryogenic engine. The twin boosters dropped away 100 seconds after liftoff while the core stage continued firing until T+3 minutes and 57 seconds before handing off to the Delta Cryogenic Second Stage. RL-10B engine ignition and payload fairing separation were confirmed before the mission headed into the News Blackout. It has been known that Delta IV would perform a three-burn profile to lift the two 700-Kilogram satellites directly into a drift orbit above the Geostationary Belt, creating a mission duration of over six hours. The first DCSS burn was aiming for a Parking Orbit around 265 Kilometers in altitude for a coast of around one hour so that the second burn could occur on the ascending node of the first orbit, lifting the apogee altitude and placing the high point above the equator. 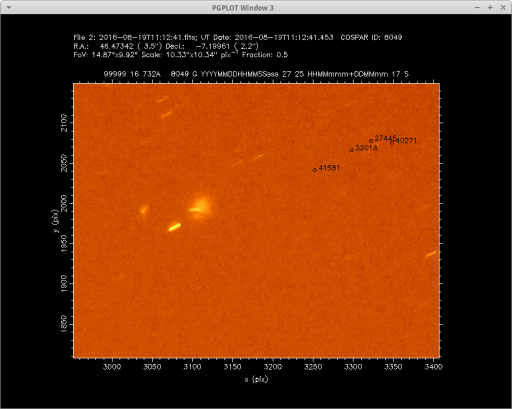 Next was a long coast of over five hours in an orbit around 275 by 36,200 Kilometers. Satellite observer Scott Tilley, based in Roberts Creek, Canada, managed to observe the stack in this elliptical transfer orbit and had his cameras pointed to the correct spot to collect stunning ground-based footage of the final main engine burn. 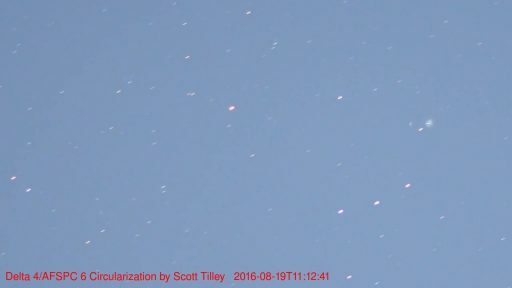 In videos uploaded by Tilley to YouTube, the DCSS shows up at 11:09 UTC when performing its third burn, placing the circularization and plane change maneuver at T+6 hours and 17 minutes. Two smaller clouds of exhaust gas emerge from the rocket stage at 11:32 and 11:39 UTC – likely corresponding to a maneuver between satellite deployments and/or the typical Collision and Contamination Avoidance Maneuver completed after spacecraft separation. Very prominent is a large cloud of gas emerging from the DCSS at 11:49 UTC as the vehicle vented leftover propellants to transition to a safe state. The white cloud of gas lingered for several minutes before dissipating. United Launch Alliance provided an official confirmation of mission success around 11:55 UTC – in line with the event times seen in Tilley’s excellent ground-based observation. Having excellent observation data of the injection of the GSSAP satellites, observers will attempt to spot the small satellites in their drift orbits over the coming days – no small feat considering the small size of the spacecraft compared to most GEO satellites. The GSSAP project was initiated in light of ever increasing potential of space militarization illustrated by the launch of satellites by different nations that demonstrated rendezvous and even robotic manipulation capability which could easily be adapted to tamper with or disable satellites of an adversary. GSSAP aims to identify and monitor such and other threats to the United States’ critical assets in Geostationary Orbit that include government and military communications satellites, missile warning craft and a wealth of intelligence-gathering spacecraft operated by the National Reconnaissance Office. Built by Orbital ATK, the GSSAP spacecraft are based on the GEOStar-1 bus and host electro-optical imagers that can deliver photographs of GEO satellites at a resolution of a few centimeters. Those who have access to imagery of satellites in flight delivered by GSSAP describe them as nothing short of amazing, but the public is unlikely to get a taste of the photos for at least a number of years. Using their optical sensors, the GSSAP spacecraft can provide information on the size and position of resident GEO objects and characterize their purpose if close-up imaging is performed. The satellites are likely equipped with a radio-detection payload to characterize a satellite’s activity via its radio emissions. Based on GEOStar-1, the GSSAP satellites have great maneuvering capability, hosting a monopropellant propulsion system with a delta-v budget of up to 1,000 meters per second, enabling frequent and significant orbital changes. 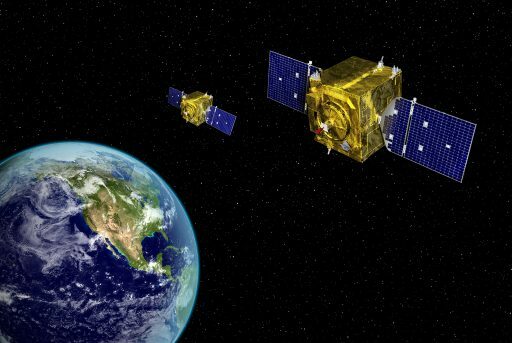 Ted Molczan, heading up a large community of satellite spotters, said the first two GSSAP satellites were seen flying in different configurations with one above and one below the GEO Belt, both below GEO, both flying in close formation or at great separation distance. It appeared that the operational arrangement was having GSSAP-1 drift below GEO at half a degree per day while GSSAP-2 was tasked with closer inspections, drifting slower and stopping frequently.